Since I’ve been home from Ireland, people have often asked me about “culture shock”. Nearly half a lifetime ago, I wandered through remote parts of Mexico and Guatemala where everything from the language, food, landscape, clothing and body language was foreign and unsettling. In more recent years, I hung out in Malaysia where I ate at a McDonalds and drove past an Ikea, but the “bathroom” in a decent restaurant was a hole in the ground with a bucket and hose to “flush”. I remember that these trips left me feeling unsettled upon my return, my daily life seemed too full of ease and my options excessive. I was happy to come home and felt vaguely guilty for it. But coming home from this trip, I wished I could have stayed. Ireland is too much like the U.S. to be obviously disorienting. Everyone speaks English—some even with a slightly disorienting American accent. There was a reassuring lack of Starbucks but good coffee was easy to come by. Free wi-fi in every bar or restaurant made my expensive (and non-refundable) international phone data plan for internet access unnecessary. And while grocery stores were far smaller than in the US, familiar brands were easy to find – we had Oreo’s at an art gallery opening and when I caught a cold, I bought Sudafed and Robitussin at the pharmacy. Every town had a butcher where shoppers purchased pasture raised lamb, pork,beef and chicken supplied by small farms instead of industrial growers. Budweiser or Coors were almost always on tap next to Guinness in the pubs. While getting a hot shower involved the sometimes puzzling use of switches to power the instant hot water tank, we din’t lack conveniences. Despite that the hotel rooms were smaller, nothing opens before 9 am and everyone drives on the “wrong” side of the road, my parents would be very comfortable there. I was very comfortable there. If someone had offered me a job in any of the places I visited, the answer would have been, without hesitation, a resounding and relieved, YES. What was strange was that there were few sirens in the three weeks we were visiting — something that is so frequent at home that I’ve had to stop saying a prayer under my breath like I used to or I’d be praying all day. (Maybe that isn’t such a bad thing now that I think about it….) I saw few “Garda” on the streets of Ireland, even in the big cities, and the only real evidence of police were the frequent and very well signed (and unmanned) speed-trap camera trailers. The local news wasn’t full of people who’d been murdered, there were no gunshots to report or child abductions to send out alerts for. And though I am sure it is there, in the big cities I saw no evidence of the drugs and slovenly poverty that are the norm in my neighborhood. I didn’t feel like I had to look over my shoulder at cash machines. I stopped putting a travel lock on my purse after the third day. Most surprisingly, I walked alone at night. 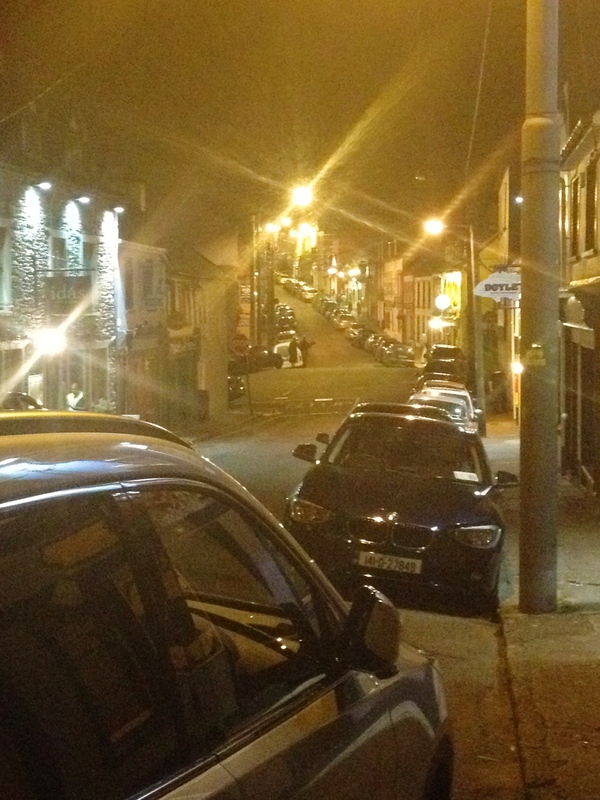 A week into our trip, we spent a few days in Dingle, County Kerry. It is a smallish, touristy town along the Atlantic, and while we were there, it was heavily populated for an end-of-tourist-season weekend music festival. I could easily imagine living there, walking along the sea to my job in the tiny, full-to-the ceiling bookstore featuring local authors that sat tucked between an art gallery and a traditional music shop, across from the main cathedral. Or wait — do I work at the corner cheese shop with its baskets of crusty breads and wood bowls filled with dark, earthy tasting olives so unlike the ones I get here? Maybe I work at the chocolatier’s with its delicious espresso, glass jars stacked with salted twists of black licorice and cases of whiskey truffles?Anyhow…..
One night we attended a concert in a tiny, ancient church a long block from where we were staying. The church had no bathroom and for me that is a big problem. So at intermission, I told Neil and Ed I had to go, and without thinking took the key and walked myself back to our room above Ashes bar. Alone. In the dark. Past several other bars whose noisy, mostly male patrons spilled onto the sidewalks. I’d never do this at home, but in Dingle, I didn’t worry about strangers or thieves or getting into an uncomfortable situation. I forgot that I normally would worry. I took my safety for granted, something I rarely ever do. 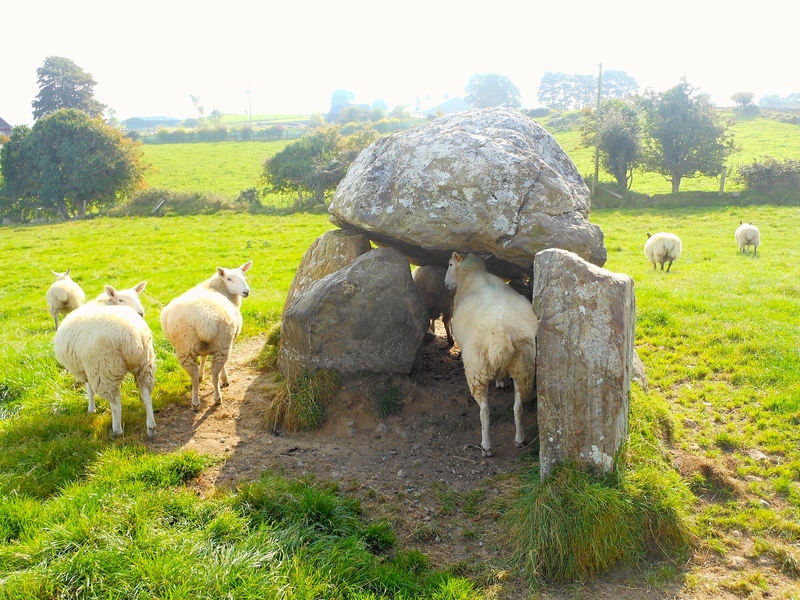 If I suffered culture shock it was this: I wasn’t afraid in Ireland. 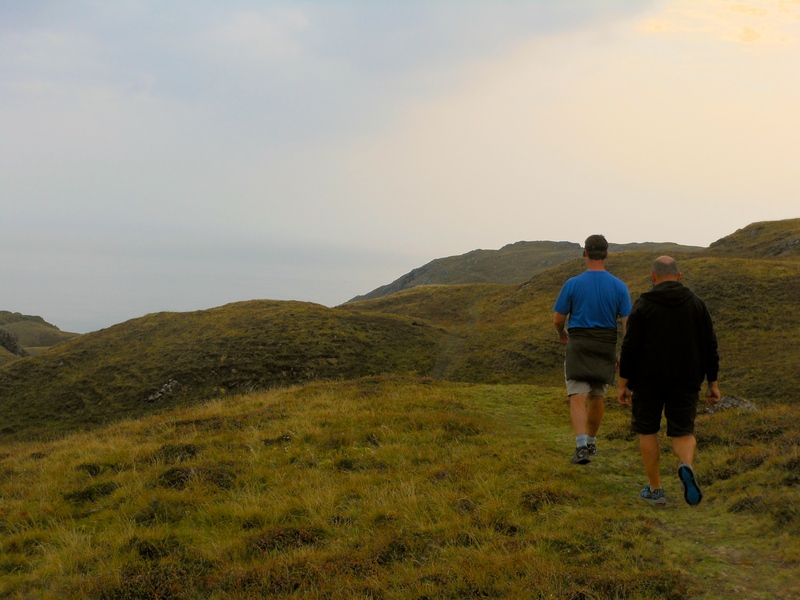 A few nights later, just as pink was beginning to tinge the sky, Neil, Ed and I walked through the mauve heather covered hills on the edge of the sea in a southwest corner of County Donegal. 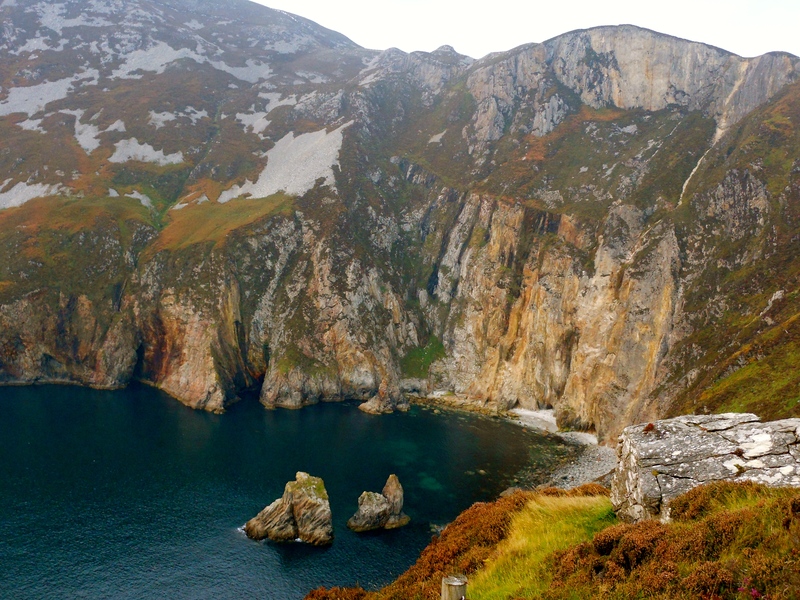 Alongside of us ran a twisting road that clung precariously to the hill—the easy route for tourists to reach our (literally) off-the-beaten- path destination: the cliffs at Slieve League. When we arrived at the gate at the bottom of the road, it was shut, which meant to us, “No Cars”. So we parked in the gravel lot and started walking. Soon we switched to following a sheep-trail along the road, the man and animal made paths rising and dipping together 1500 feet above a luminous blue-green sea. At such a height, the crashing waves were a faint whisper and the only sounds were the occasional gull and the bleat of sheep heading for their beds. But the trail was long and winding, the ground marshy and twilight was rapidly turning to night. 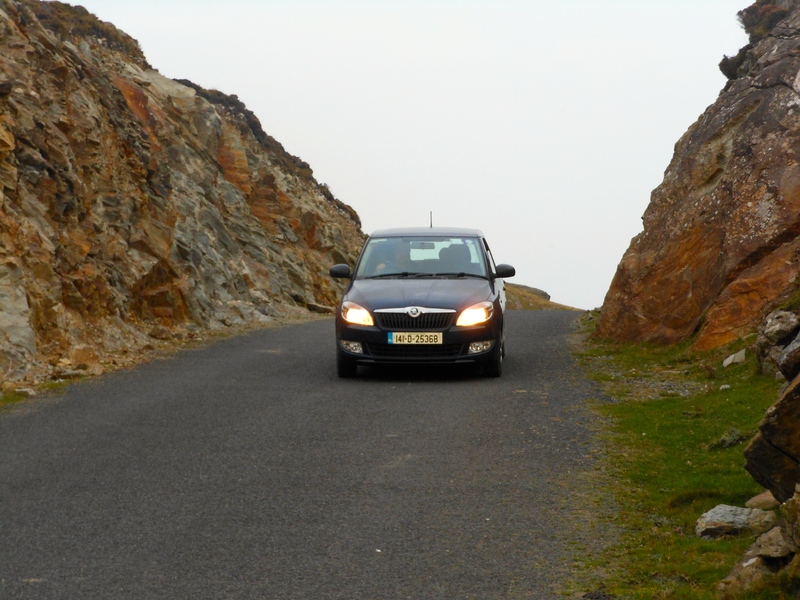 After seeing a couple cars go up the road and back down, Neil and Ed decided to go back for our little Skoda. But, uncharacteristically, I told them to go without me —I wanted to keep walking and meet the car as they came up the road. I don’t know what possessed me—I didn’t even know if they would be able to open the gate and I couldn’t rely on my cellphone in the hills. It was getting dark and I really had no idea where I was going except that I knew the road would, eventually, simply end. And yet, I was blissful. Choosing to be comfortably alone is a new thing for me. I don’t travel alone much, though when I have I’ve been surprised at how exhilarating it is, even with my hyper-awareness kicked in. At home I don’t often go to coffee shops or tourist spots alone for fear of weird people and weird situations. My workplace, just a few miles from where I live, is frequented by thieves and drug users and there’s been months when I’ve called the police every week. I pick up used condoms and drug needles from ditch in front of my house and there have been times when gunshots or police chases weren’t unusual. The people who live across the street from us (who I don’t know) have no less than six signs warning they have a “Dangerous Dog” stapled to the outside of the house. There is a prostitute who lives down the street and a variety of “working girls” who pretend to just be out for a walk along the main drag, a short block away. From my bedroom window I’ve watched drug deals between adults happen on the same corner where the school bus lets off kindergarteners. Owning a gun here is something of a given. Even if I escape to the rugged green Cascade mountains and foothills I love, hiking alone in is not a safe option. I’ve come across naked men, crazy backwoods druggies and numerous people that raised the hair on the back of my neck as we passed. A few years ago a mother and daughter were murdered on a trail I grew up hiking, a crime that has gone unsolved. No matter where I am, I am always on the alert and always suspicious even while I am normally friendly. There are a lot of things I would like to do that I don’t do because I don’t think of my world as “safe”. Neil and Ed headed downhill to get the car and I continued upwards, following the road. The only souls around were the sheep that glanced at me suspiciously as they passed, their hooves clattering on the asphalt and rocks. I inhaled their warm musky smell deeply. I wished I could dig my fingers into their woolly backs, but they were as spooked by me as I would have been by encountering a person on a trail at home. As I walked on, a bend in the road provided a window through the gorse and stone that would have been too small to see if I’d been passing in the car. 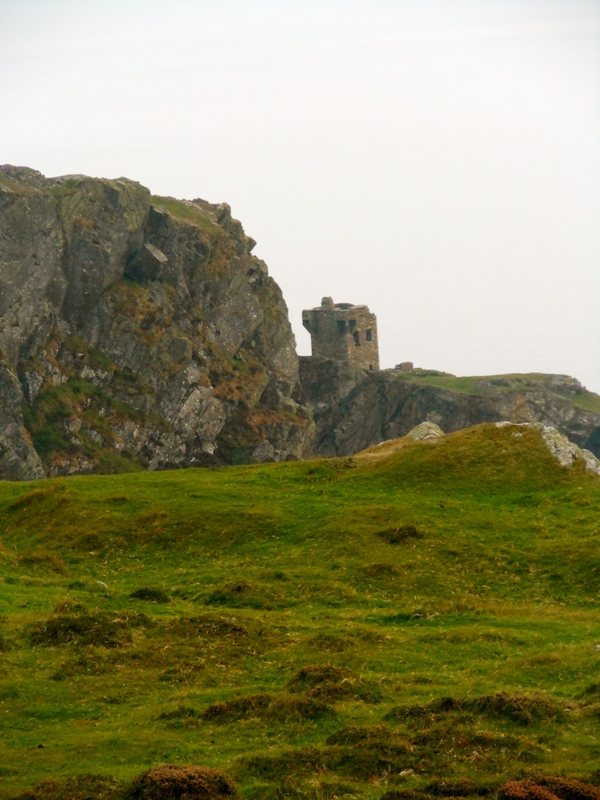 Perched on the edge of the cliff just below me sat a watchtower, its tired, weathered walls slowly giving way to time as it disappeared stone by stone into the sea. I tramped through the heather eagerly and fully at peace, snapping pictures, breathing in the solitude and independence and relishing the opportunity to experience this place on foot. When the soft sound of a car coming up the hill finally reached my ears, I stepped back onto the road without fear, knowing it would be the guys in our tiny blue car. Never for a moment did I worry otherwise. I hadn’t worried about it getting dark or about getting lost or about stumbling into strange strangers or about the possibility that my cell phone reception could have dropped, leaving me unaware that the guys weren’t coming to get me. All that background static I normally carry from personal experience, the fear of the unknown and the endless bad-news the media shoves down my throat, was silent. 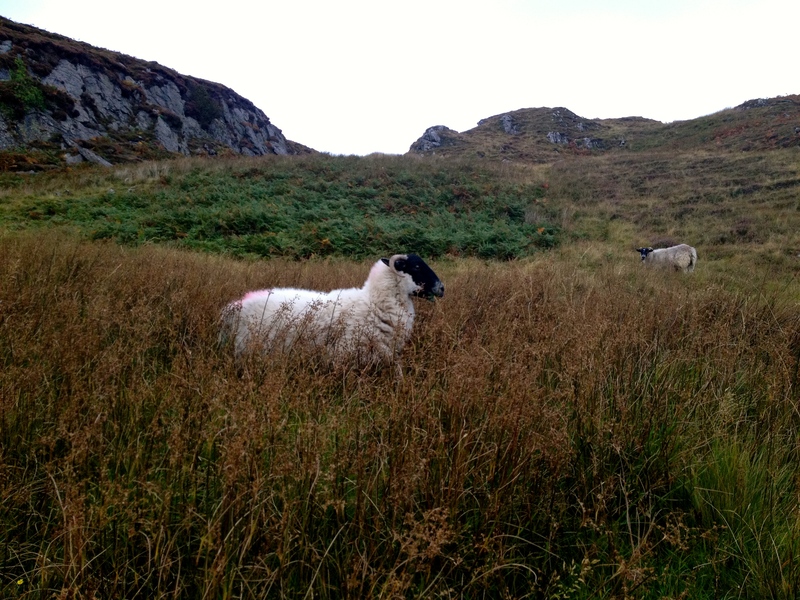 And it wasn’t just silent in this far away place at the end of a remote road in Donegal, but everywhere. I felt at home and safe in the ancient land that surrounded me. 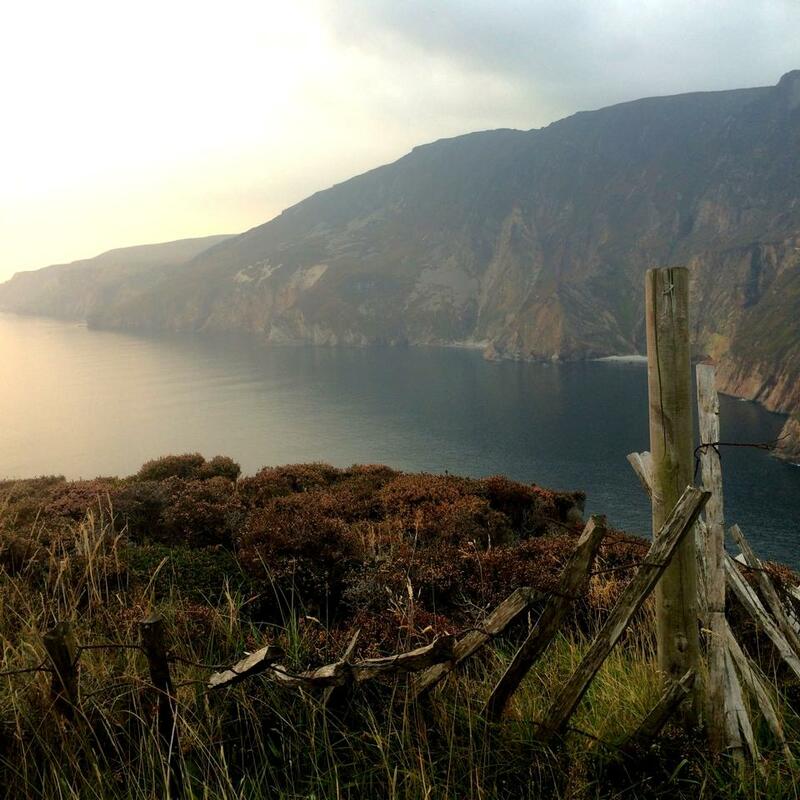 I fell in deeply in love with Ireland’s beautiful, desolate and unforgiving wide open spaces. The lessons learned from working with and around the weathered terrain were reflected in the gentle strength and endurance of everyone I met. 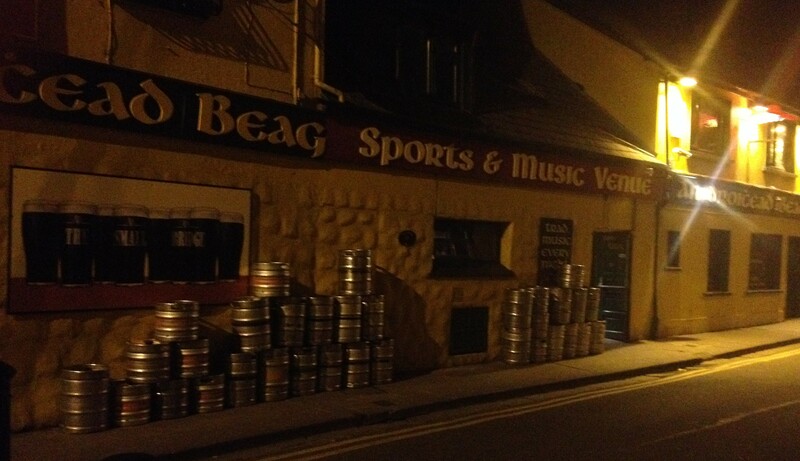 The Irish are passionate about the things that draw them together and pragmatic about the things that keep them apart. They seem to breathe full, expansive breaths instead of the manic stunted ones of city-dwelling Americans. The Irish national identity of triumphing over the odds of weather, geology and politics is far different from the impetuous upward mobility and entitlement of America. There is a lack of hurry—a bone deep understanding that there is a time and place for everything. Perhaps that is to be expected in a country that seems to weave itself around the land instead of around the eternally changing whims of society. It seemed easy to slow down in Ireland, easy to regain the footing I felt was crumbling beneath me in the months before I left. My trip reminded me that I am not a short-tempered, hyper-vigilant, exhausted, pain riddled person confined to an urban world. I can be part of an ecosystem that shares without threatening or feeling threatened as a regular mode of existence. Harmony is possible, and though days can still be a struggle, there is also plenty of opportunity to walk placidly home in the sunset. In the remote lands of the counties of Cork, Kerry, Sligo,Galway, Donegal and others, I was reminded that there is space for me — I needn’t feel pressured to be small, to take up less space, to be noticed less. I can be radiant and expansive or as fragile as a shell—both are acceptable, both are integral parts of the. Maybe I just relaxed because I was on a three-week vacation, each day rolling out with a lack of hurry or dread. Maybe I brought home a romantic notion of a poverty riddled country with a history of violent upheaval that I got to visit as a member (barely) of a privileged economic class who get to take vacations. I want to spend more time there to be sure. I’d like to explore the connection people have with the land I felt such a profound resonance with—farmers who watch over stone portal tombs in their pastures, artists who write, draw and sing about the regions they were born in, business people who make their living the way their ancestors have, families who have worked the same land for hundreds of years. I want to immerse myself in the flow of time in that unhurried place. 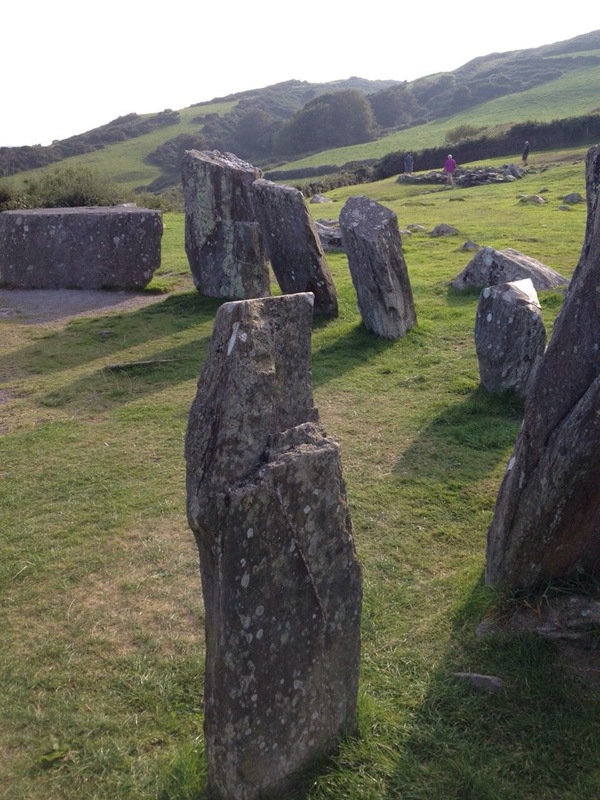 Maybe when you are surrounded by castles hundreds of years old, stone circles thousands of years old and neolithic settlements that reach back 2,000 years before Christ, nothing has the urgency we feel here in my young country. And maybe the lack of Ireland going anywhere fast keeps the greedy take-what-I-want attitude at bay, leaving people like me feeling safe. I’d like to find out. I don’t think I fully realized just how unsafe I feel every day until I didn’t feel it anymore; the hole left in its absence making me pay attention. And going back to work started with a bang: my second week back, I called the police about a drug crazed man with a dirty mohawk wielding a broken hockey-stick like a weapon in front of my store. The next day I nearly called again over a coked-out junkie who remained parked next to my car as I closed up. That night, someone broke in, shattering the glass front door with a rock, stealing a bike. My (male) boss put cardboard over the door and spent a restless night alone on a bench with a baseball bat and can of Mace until I arrived in the morning. And yet, my return from Ireland has left me feeling empowered instead of victimized by my vulnerability. Perhaps some of the strength possessed by powerful Irish women like Queen Medb, the Hag of Beara, and the Pirate Queen, Grace O’Malley collected on my shoes along with the dust of their homes, giving me courage to face the fears I keep hidden. Maybe the resiliency of the land and people gave me perspective about my ability to persevere.Or maybe I just came home rested for the first time since I began graduate school three years ago. What makes you feel safe or afraid? How do you cope with daily fears? When have you surprised yourself by stepping out of your comfort zone and how did you incorporate that into your life? How do we integrate the violence that surrounds us without becoming overwhelmed and disempowered? And most importantly—where have you found places that give you peace, strength and comfort? Dearest Robin, I am sitting in a coffee shop in Portland trying hard not to cry.Though there are probably many places in the US and in the world where I feel safe, and you might feel safe, I know too well what you are talking about. It breaks my heart. I am so close to leaving my home for this an several other reasons. We’re in central AZ this month. I think I feel safe walking Spring Creek, but peacefulness and connection to nature are illusions shattered every time someone just over the ridge starts their damn car. Back in the valley? I am alert from head to toe at all times, even at home, during the day. It’s exhausting.